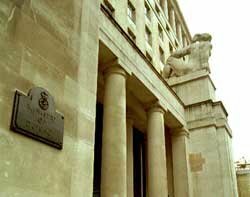 The Ministry of Defence has launched an investigation into the loss of a hard drive containing the personal details of members of the armed forces, by contractor EDS. The drive could contain data on 100,000 members of the armed forces, and 600,000 potential recruits, according to reports. An MoD spokesman said the portable hard drive, which was used to access a large database of armed forces applicants, had not been accounted for. He said it was not yet clear if it contained any information. "The hard drive was used in the testing of one of our personnel administration systems. That system includes data from applicants. We do not know if any of that data was on the hard drive." The hard drive went missing from a "secure location" in Hook, Hampshire. The MoD said it could not confirm whether or not the disc was encrypted. The MoD said in a statement, "On Wednesday 8 October we were informed by our contractor EDS that it was unable to account for a portable hard drive used in connection with the administration of Armed Forces personnel data. This came to light during a priority audit EDS are conducting to comply with the Cabinet Office data handling review. The MoD Police are investigating with EDS."